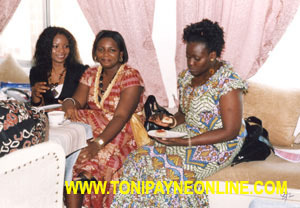 As I mentioned before Exquisite Magazine hosted a tea party in Lagos featuring Toni Payne Cosmetics. Below are some pictures from the Tea Party.. I have more beauty talk/sessions coming up this year and next, worldwide. Will post dates and locations so just in case I am in your neck on the woods you can come down to watch me speak. (I promise not to bore you). I am also planning an event in LAG for early next year. I can’t release the details yet but it will be a must attend event with massive media coverage. I will update you once everything is set in stone. Enjoy! What color gloss should I use, Try this! I hope you enjoyed the some of the pictures. I will most likely put some more exclusive ones up once they are done making their press rotation. A special thanks to Beautiful You makeovers for coming through, you did a fab job, also to Oka and associates for such wonderful pictures. If you need a makeup artist or photographer for your next Lagos /NIG event, they come highly recommended so feel free to email me for their contact info. YOU ARE ON FREAKING FIRE!!!! LOVE THE PICS! heyy odmoly is my pally and funny enough we had talked about you when i was home in September because we saw your ad in citipeople. Anyways, will get to test out your makeup when i go for Xmas and im excited you picked Odun – she’s great! Please let us know when its online! Lovely pictures. You are definitely doing your thing! @ineka, thanks madam, how have you been? 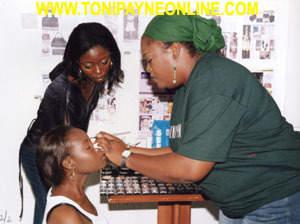 So were xactly can one get ur line of products and Toni Payne Signature Apparel to buy in naija. yhanks. i will check it out!! lol..i met thanks.i have been lookin for that particular apparel. will get back to u, wen i get them. Congrats o. Ahn ahn….well done. I’m still waiting for my make-better session o. I wanna be a fine babe as well. 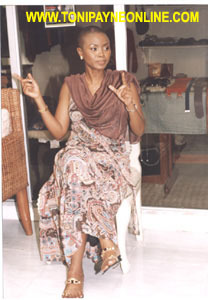 Tseshe Darl, My number 1 super model. I promise not to keep you waiting for long, you know I need to set up the shoot.